I’m delighted to announce the release of the Audible Audio Edition of Intertwingled. If you already have the Kindle Edition, you can add the audiobook at a discounted price, and then switch seamlessly between reading and listening (or do both at once) thanks to Whispersync for Voice. To make all this magic happen, I barely had to lift a hand. Using ACX, I ran a casting call, reviewed auditions, chose a producer, and made a deal. I went with the 50-50 royalty split (no risk or upfront investment). Gary MacFadden did all the hard work. Now that my book is available in print, digital, and audio editions, I have to say I’m impressed by Amazon’s infrastructure for independent publishing. Of course, I do worry about Amazon’s monopoly power as well. That’s why I’m so happy that Intertwingled is now also available via O’Reilly Media and Safari Books Online. Register for my free Webcast (tomorrow) to learn about The Architecture of Understanding. 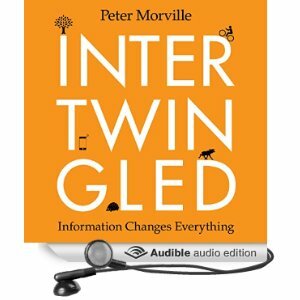 If you’re willing to write a review, email me, and I’ll send a code for a free Audible Audio Edition of Intertwingled (US and UK only). Also, I’m running a raffle (today only) via Twitter.